As a young yacht designer, in the 1960s, I did the first versions of what became a whole range of our sailing dory designs. 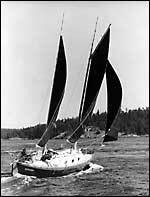 My goals in doing the original design work are very similar to what led Annie and Pete Hill to choose our 34' Sailing Dory design to build their voyager, Badger. I wanted to create the type of boat that provided the most useful and capable cruiser on a very small budget. Since the prospective client for the first design ideas was myself, I could be completely ruthless in pursuit of anything that would simplify the boats and hold their costs down. Over the ensuing years we've sold plans for hundreds of these sailing dory designs. A number of them have made ocean passages, and their owners have all told us how much they liked the boat's design and how capable they turned out to be at sea. The construction scheme that I originally devised has been carried out throughout the whole line of designs. The planking is done with sheets of plywood glued and fastened to the bulkheads and furniture in the boat, which becomes the structural framing needed to keep her in shape. Floor timbers span from chine to chine to take the load from the keel bolts. To this is bolted the cast lead or concrete and scrap-metal keel, depending on the version. This sub-assembly can be bolted on just prior to completion and launching, so that the boat can be set noticeably lower in the shop to make access to the work easier. The longitudinal framing consists of the clamp and chine logs, plus the raised deck and/or house framing. There are no ribs to contend with, nor any deck beams, except for a temporary framework while the deck layers of plywood are being glued together. The simple, straight lines of these hull forms mean extremely easy lofting work. A professional shop can loft one of these in a matter of a few hours. The straight-line shape also means that there are very few instances of having to fit curved pieces to the hull during outfitting. Thus, the joiner and outfit work goes much faster than with a round bilge hull form. Professional boatbuilders tell us they can build these boats in even less time, indicating again that these certainly are the most boat for the money invested. Can the dories be built in other materials? Yes, with some qualifications. We've done an alternate construction for one of them for building with several layers of timber laminated to a similar thickness as the plywood. We've also done aluminum versions for the 36 and 37½-footers. The aluminum makes for a vessel of about the same structural weight. Cored fiberglass is another way to build them, and we've done scantlings for the 36 and 37½-footers for this method. We've also done a steel version of the 36 as a power fishing vessel, but the weight gain was so much that there was no leeway for ballasting the boat if she were to be a sailing vessel and still float anywhere close to her designed waterline. My personal choice would still be for the plywood construction. Several of these dory designs have alternative rigs already drawn for them. The Hills are persuasive advocates of the junk, or lug rig. On the larger dories there is enough stability to carry the weight of these rigs, which typically weigh more and have this weight at a height that raises the center of gravity a bit. We did an inclining test on Badger when they visited us and confirmed that she had positive stability to about at least 125° heel, even with her loaded with all their worldly possessions and with the heavier junk rig. As they have proven, this has made for a very capable voyager. Many people who know dories only as rather tender open rowing boats are surprised at how stable these sailing versions are with the outside ballast added. Pounding is something that is rarely experienced when sailing these dories. Even though they are flat bottomed, they present a v-shape to the water when heeled and this makes a more graceful entry into the waves. The only report I've had of one of them pounding was when the Donna was coming in across a breaking bar on the Oregon coast - under power. Thus, she was upright, and it was only reasonable to assume that there would be a brief period of pounding during the crossing of the bar. 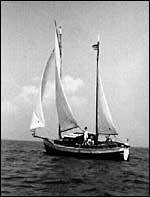 Donna, the first of the 36-footers, was re-rigged from the original gaff ketch to a taller Marconi ketch rig after several ocean passages. 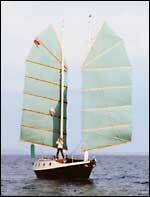 The rationale was that the taller rig would make it easier to catch the lighter Pacific trade winds. This rig, added at considerable expense, did indeed make for better ocean sailing performance. If this is truly a concern, I'd opt for the taller cutter rig initially. As the time of writing this, we've work well along on a larger, 45' sailing dory motorsailer. 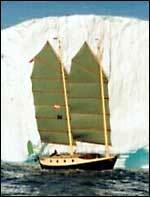 We've also done design work on a concept for a 60-foot, three-masted junk schooner a couple decades ago. These are mentioned because there really should be no upper limit to the size of sailing dories that could be designed. If you would like a larger sailing dory, please don't hesitate to contact us and we can discuss what's involved in creating another new design for your use. Length Overall 26'-0" 30'-0" 30'-5" 31'-8" 32'-0" 34'-0" 36'-0" 37'-6"
Length Datum Waterline 23'-1" 26'-0" 26'-0" 26'-0" 27'-0" 28'-0" 31'-0" 31'-0"
Beam 9'-9¾" 10'-0" 10'-0" 10'-0" 9'-0" 11'-0" 11'-0" 11'-0"
Draft - fin keel 3'-0" 4'-0" 4'-0" 4'-3" 4'-0" 4'-6" 4'-6" 4'-6"
Draft - long, shallow keel (opt.) 3'-9" 3'-3" 3'-6" 3'-6" 3'-6" 3'-6"
Freeboard, Forward 4'-6" 4'-6" 4'-6" 4'-3" 4'-2" 5'-0" 5'-0¾" 5'-2½"
Freeboard, Least 2'-8¾" 2'-8¾" 2'-5¾" 2'-6¼" 2'-9" 3'-0¼" 3'-0¼"
Freeboard, Raised Deck 4'-4½" 5'-2" 4'-11" 5'-1" 5'-4"
Freeboard, Aft 3'-8½" 3'-3½" 3'-3½" 3'-0½" 3'-6½" 4'-0" 4'-2¾" 4'-9"
Headroom 5'3"/6'1" 6'-1" 6'-0¾" 6'-0¾" 6'-1" 6'-3½" 6'-4" 6'-4"
Note: The draft, displacement, and ratios of the 30'-5" and 31'-8" Sailing Dory designs show the variations of the 31'-8" boat floating three inches deeper than the 30'-5" and the changes that follow from that variation in weight and loading. *Caution: The displacement quoted here is for the boat in coastal cruising trim. That is, with the fuel and water tanks filled, the crew on board, as well as the crews' gear and stores in the lockers. This should not be confused with the "shipping weight" often quoted as "displacement" by some manufacturers. This should be taken into account when comparing figures and ratios between this and other designs. Also, loading down for voyaging and living aboard, as with the Hill's Badger, will add considerably to these figures, perhaps as much as 50%. Designs like the 34' Badger, which load down gracefully and still sail well, make a good choice for anyone wanting to go voyaging on a small income. © 2002-2016 Benford Design Group. All rights reserved. Site Designed and Maintained by: Rhyno Designs.